This piece contains detailed accounts of suicide ideation. Please use your discretion. Depression and suicidal thoughts. Two things that not a lot of people like to talk about. Can you blame them though? I mean seriously, who really wants to talk about those things? I know I never did. That is, until this past year when those two things surfaced in my own life. Before I continue, know this: I am not a psychologist. I am not a psychiatrist. I haven’t even been clinically diagnosed with depression by either of those. Does that minimize my perspective to you? Maybe it does, but that’s okay. Because what I intend to do is bring light to the stigma surrounding depression and suicidal thoughts. Not just bring light to it though, I want to help dissolve stigma. On February 21, 2017, I started to see a therapist. I was nervous, I felt extremely weak for even admitting I was experiencing depression and suicidal thoughts. But when I did, when I spoke the words out loud to another human, I found relief. It felt like I could breathe again, like I wasn’t hiding anymore. During that first session, the therapist reassured me that coming to him and seeking help was a sign of strength, not weakness. What an interesting concept, I thought. Essentially—be the best at everything—it was okay to appear weak? To need help? And more so, it was actually a sign of strength? Having that conversation made me want to engage in more conversations, to create dialogues with people that allowed them to not feel isolated in their struggles. For me, being isolated was the scariest thing. The days I felt most depressed and suicidal were only enhanced when I isolated myself; when I decided that no one wanted to hang out with me or loved me. Those days were the worst. Those are the days it was hard to go on. 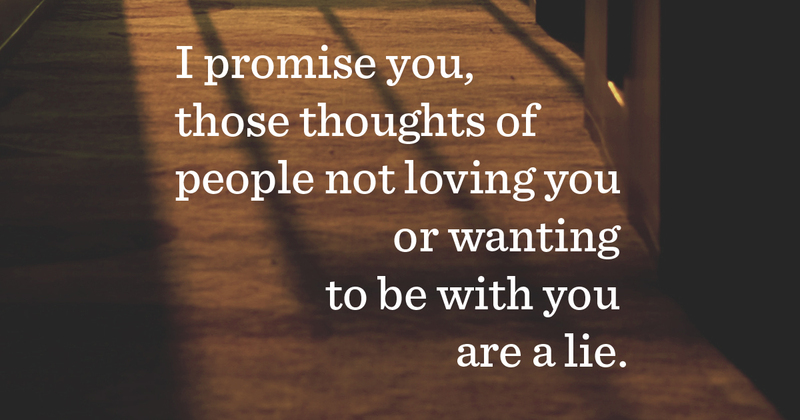 But I promise you, those thoughts of people not loving you or wanting to be with you are a lie. And no, this isn’t my quick fix. I’m not saying you can eliminate depression and suicide ideation just by avoiding isolation. It won’t. And I know how hard it is to be with people when you are feeling no emotion at all, faking smiles and conversation is exhausting. But I also know how hard it is to be alone when you’re feeling those things. I was recently having a conversation with a buddy who deals with depression too. We started sharing our own experiences and quickly found that we both shared common ground when it came to what helped us the most: talking to others who are struggling. People who we thought would never struggle, people who helped us to not feel alone. It was September 29, 2017. I had made a playlist to listen to that had songs talking about suicide and depression—morbid, I know—but it helped me feel understood. One of the songs on the playlist is Logics’s “1-800-273-8255”, the title of which is the number to the National Suicide Prevention Lifeline. That song has gotten me through a lot of rough days, September 29 being one of the worst. Regardless, that day started off okay, nothing too overwhelming—it was Friday after all. Still, I felt off, empty and apathetic. Being someone who projects the idea that I’m “always doing good” and strive to make others laugh, I didn’t want to tell anyone. Not even my girlfriend Allie, who I had been texting the entire day, telling her how excited I was to hang with her and some friends after work at Whole Foods for a wine night—something I love to do. Fast forward to those plans, and instead of feeling joyous and vibrant, I was feeling anything but. One thing I’ve learned about depression is that it comes out of nowhere. It’ll just hit you when you’re least expecting it. At times, it’s mentally paralyzing. Most days I can hit back, but on this day, I couldn’t. So that night I told my friends that I wanted to go home and take a nap because I was tired. That was a lie though, I just wanted to be alone. So I left. As I drove home, I battled thoughts of driving the car off the road, convincing myself I had no use to the world or the people in it. When I got home, I felt helpless, but I couldn’t tell anyone for free that I would burden them. Distraught, I found myself searching through my roommate’s belongings, looking for pills to take. Unsuccessful in finding any, I just laid on the ground and wept. As I lay there, I started thinking about my friends, my family, and my girlfriend. Was it true I was no use to them? Was it true that this world would be better off without me? These questions caused more tears to surface, which eventually led me to reach for the phone. I sent a text to a friend that I knew was familiar with depression. After I told him what was going on, he urged me to go back to my friends. He reassured me that my friends loved me, that he loved me, and that I needed to be with them in that moment. I didn’t want to. But I went back. And honestly, I think it saved my life that night. To those who struggle, I urge you to reach out. If no one knows what you’re going through, please tell someone. Your life is worth it. I love this so much. I am starting over for the 3rd time, with a new counselor for my 12 year old daughter. It’s been hell. I feel like somehow I’ve contaminated her with my mental health issues even though I fight like hell to hide them from my kids. Very few people know what’s going on with her. But recently she started self harming and I felt like if I didn’t say it out loud to somebody then I would never accept it. So the few I chose to tell, that I thought I was already too much of a burden on, that I thought would reaffirm my thoughts I was failing as a parent, actually said “I understand”. It made breathing a little easier. Which makes makes my fight for my daughter’s life even stronger. It’s very, very hard to accept people can love you when you don’t love yourself. I have to save her from that. Jen, you are blessed to have such a solid & compassionate support system. Many people don’t have that — esp. if they engage in self-harming/self-sabotaging behaviors. I hope God will lead your daughter to the right individuals who will love her, accept her and stand by her the way her mom does. We’re sorry that you’ve had negative experiences with sharing your story, we would encourage you to continue looking for people who feel like safe places to open up to. You deserve to have people in your life who you can count on as a community of support. You are so valuable, so loved, and so worthy of good friends. We are honored to know you in part. If you are interested, you can reach out to our team at info@twloha.com. We would love to hear your story and send you some encouragement. Thank you for helping to dissolve stigma & for encouraging conversation on this topic. I don’t isolate as much these days, but I find that I am still numb emotionally around others & I’ve definitely mastered “the fake smile” . . . but yesterday I engaged in a rather lengthy (unplanned) chat. I was pleasantly surprised to find common ground. True, I was exhausted by the end of it, but I was also so relieved that we each were willing to invest the time. It was so nice to see and be seen; to hear and be heard; to know and be known. I am grateful — both for that time and for your courage and strength to share your story with all of us. This has to be one of the most inspiring blogs I’ve read. Depression really does come out of nowhere paralyzing you. I’m glad you are alive, this is something I definitely needed to read today. I am in the same place right now. Thank you for sharing! Thank you for sharing your deeply personal story. It is a powerful, yet simple, reminder that people don’t want to live without us. I dont know why I came to this blog today, but I needed it. Thank you. This story is so close to my heart. I too deal with depression, anxiety and suicidal thoughts. I am 15 years old and I have reached out for help twice over the past year and have had no real help from them, my school nurse applied me to go to a place called CAMS and they turned me down. I have a past of self injury which was the main topic of why I needed help and still need it, I never got to tell the nurses about my thoughts of suicide, I never truly trusted them and then when I was gaining trust the one nurse left me for a different job and I haven’t seen anybody since. This was around may time this year. Last summer a lot was going on in my life and it all got too much so I took mys of aside and was ready to end my life and that day still haunts me. I’ve recently wasted the ‘To write love on her arms’ film and it really hit my heart, I could relate to many parts of that film and has made me think about getting a better source of help. If you could reply with any places to talk to somebody in The UK midlands it would help me massively. Thankyou. We are so glad you are here. We are glad that you are still seeking out help that works best for you. Your life is important and worth fighting for. If you would, email us at info@twloha.com and we can try to help you find some resources in your area. I have had anxiety, depression and suicidal thoughts for over 30 years. There is no end, no light in the tunnel, no amount of loving hugs, medication or therapy sessions that will quiet the voices in my head. There is just the end that i look forward to, to piece. We know how hopeless this life can sometimes feel. We understand how you are feeling right here, right now. But our hope would be that you, as you have for many years, continue to fight for yourself and the hope you deserve to believe in. Doing that is easier said than done, but know that there is an entire team of people who believe that it can happen for you. Would you email us at info@twloha.com so we can learn more about your story and offer you some support and encouragement? It would be our honor. Please reach out. We are heartbroken to hear about how you are feeling and what you have been through. We know that sometimes when you open up to people, you do not get the response that you are hoping for. We do not want this to discourage you. Even though there will sometimes be negative reactions, there is always the possibility that a person’s reactions will be positive and supportive towards you. Whenever you feel ready to reach out again, we encourage you to reach out to someone you trust – a friend, a teacher, a family member, a counselor, someone who you believe will be supportive of you. If you would like, you are welcome to email us at info@twloha.com. We do not want you to feel alone. We are here for you. I came to the Twloha website after just watching the film about Renee Yohe’s story. I’m 59 years old & have struggled with depression, isolation for as long as I can remember. Part of me wants to be the strong person who asks for help & draws inspiration from others. The person who can stay happy & be inspirational to others. The other part of me just gets so freakin tired. I’m the person who wants held & reassured I’m enough. I’m ok. Somone loves me. I’m necessary. Your story Finding Common Ground helped me today. We are so glad that this post was able to help you. We know how difficult and tiring it can be to continue to be strong. Please remember there is nothing wrong with taking time for yourself. There’s nothing wrong with needing reassurance. There is nothing wrong with needing other people. We all need other people. Please know that you are important, and you are enough. You are always welcome to reach out to us at info@twloha.com. You are important, and we are here for you. Your efforts offer a keyhole looking through the door to survival for those of us who suffer chronic depression and have battled suicidal ideation … it is like being caught in quicksand and fearing no one will be able to get you out. But, I deeply appreciate being able to share that my life has been that struggle and I am going to reach 65 years of survival … my journey has been long and sometimes treacherous. I have been hospitalized 9 times and have had to get ECT to help me out of a depressed state that would not respond to medication. But, the one thing I’ve learned is that no one can truly save us … we have to do it ourselves (with the help from others). Life-affirming thoughts are like the rung of a ladder … I picture being in a foxhole with machine gun fire whizzing about as we try to grab hold of soil and slowly pull ourselves out … I have gained strength through the 12 step principles as practiced in Emotions Anonymous and Recovery … and a book entitled “Mental Health Through Will Training” by Dr. Milne is a great start … it shares wonderful, short affirmations that help adjust our thinking for it is our perception of things that has to change. It is through ‘the rooms’ where I met other sufferers who had self-medicated with drugs and/or alcohol … one friend opened an amazing door into getting professional help with insight into bi-polar disorder. Well, I followed that clue I gained some real help to a life that was ripping me apart. Sometimes I felt like everything was right with me and I was in harmony with God’s creation … I still feel that way and am grateful for the optimism but I fall from the perch and still grovel in the mud of depression … a simple statement ‘what goes up must come down … but what went down must go up again’ helps me keep a steady foot on the tightrope. It has been years of therapy, learning, etc., that has brought me to a much more powerful connection with prayer and studying the bible has given me a confidence building compass. The first step of the 12 steps is that we came to realize our life was unmanageable … then we turned it over to a greater power (which is a conscientious step and varies for all) … the rest is to clean house and make amends … the last step is to reach out to others to help them out of their foxhole. One of the tenets of the programs is ‘put gratitude in your attitude.’ Now, I know who I am grateful to (James 1:17), and, while it is still a struggle, I have built up a faith based on the bible and I recognize a God who is love and has an intimate name, Jehovah. Surely, a loving father would not give a stone to a child that was asking for bread? That is the kind of thinking I have developed and it has been a stalwart friend in times of darkness. The outside is always changing, it is only within my power to change and steady me, someone who is always in the processing of living and is always in the process of surviving … one day at a time. One more thought, Joshua … the world is living in the lies started by a dark, greedy mind … and henceforth, all of its striving is in darkness, too. Your blog is a Godsend to so many … thank you for allowing us in and opening the door to a healthier state of being. Thank you for sharing this!! I read so many great and helpful pieces, but THIS one.. this one really hit it head on. I get it, it’s a constant struggle, while I don’t consider myself having depression, I have panic attacks that come out of nowhere and do to me just what was described in this post, except the panic attacks go far beyond and there is no reasoning.. I reach out and no one understands the severity of what’s happening and that if I’m reaching out, it is a very last resort, I need someone and I’m not safe on my own. No one ever seems to come… and I don’t actually want to die, so I find a way to survive! I really don’t know how I’m still alive, but here i am, kicking and screaming, doing my best to make it through another day.. hoping that every day of my life aren’t going to be like this.. I hate these panic attacks.